Young Harris College freshmen and new students were introduced to the college experience through this year’s “Florescent Fury”-themed Welcome Week by the Campus Activities Board, CAB. Welcome Week began Aug. 13, when students began moving in the residence halls. Students were welcomed with a sugar snack attack, which served ice cream, cotton candy and other sweet treats on the plaza. The night ended with the trivia game “Think Fast,” where students had the opportunity to win $200. The week continued with various events including a mechanical bull, airbrush tattoos, a concert by Trevis Prince, a Florida-based performer who considers his work to be a blending of pop, rock, and soul, and a magic show and a dance hosted by the Gamma Psi sorority. There were also various meetings, including Academic Convocation, and a mandatory residence hall meeting for all campus residents. The annual poster sale on the plaza, the blood drive, held in Meyers Student Center, and Saturday’s community service rounded out Welcome Week on Aug. 20. “Welcome Week helped me meet new people. It also gave me my first taste of college life,” said Freshman Paige Sexton from Canton. The CAB events ended the following Saturday with a community service project in the morning and video gaming stations set up on the lawn that evening. Students were invited to come challenge other students to video games. “The point of Welcome Week is to help new students transition easier to college life and help relieve the stress that comes with the first week of classes,” said Calle Wallace, a senior who helped coordinate the events for Welcome Week. Wallace feels Welcome Week was very well attended. Once the freshmen realized the events being hosted on campus were for them, more and more of them started attending. 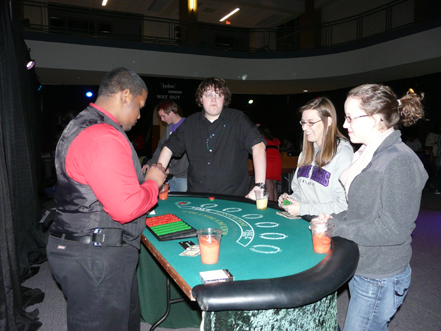 This past Saturday, Feb. 12, the Campus Activities Board or CAB hosted their annual Casino Night at Young Harris College. Held from 8 p.m. to 11 p.m., the event was organized by Rouseline Emmanuel, director of Campus Activities. Students gathered in the Recreation Center to enjoy a mix of food and casino games throughout the night. As students arrived they were handed mock dollar bills to take and exchange for chips to play their choice of games for the night. Among the many casino games were: Russian Roulette, Blackjack and Craps. Also setting the casino-like atmosphere was the addition of virgin daiquiri’s, and other treats such as pigs-in-a-blanket, which were provided by Sodexco. To help transform the recreation center into a casino, there were two large screens playing mainstream pop-culture music videos. This, along with neon and strobe lights that hung from the ceiling helped set the tone for a night of casino games. Emmanuel explained that Casino Night is an event held on campus every year at YHC, and it only costs about $3,000 to fund the entire event; and, due to popularity it is something that CAB plans to continue doing in the future. TjohnE Productions Inc. provided the games and entertainment for Casino Night at Young Harris, as they have done for the past several years. Fantasy game shows, fantasy casino and even simulated sky diving, are just some of events that TjohnE Inc. will provide for colleges, universities, and high schools all over the country. 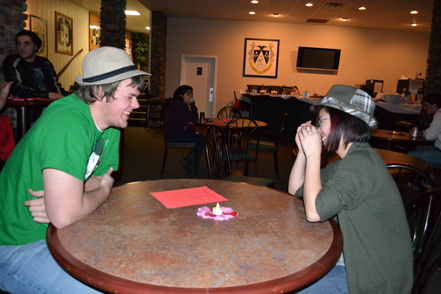 Thursday, Feb. 10, Campus Activities Board or CAB hosted speed dating in the Myers Student Center. 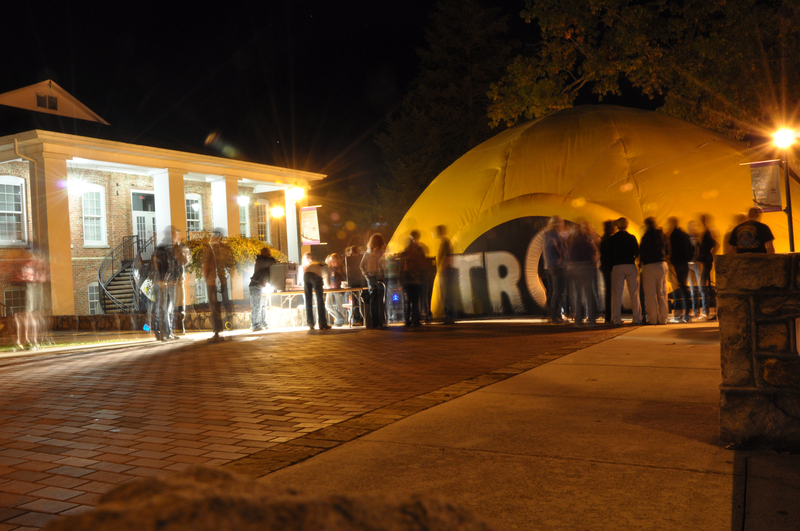 The event was planned by the President of CAB, Tara Shiver and lasted from 9 p.m. to 11 p.m. The idea behind speed dating is for a person to meet as many new people as possible in a short period of time. The participants of speed dating will sit with another person for a certain period of time and have short conversations about anything they want. Most speed dating requires early sign up to make sure that there are an equal number of participants. Most speed dating events also have to be paid for. 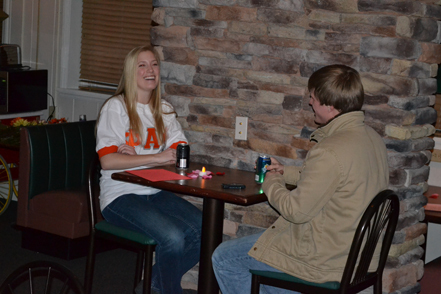 The participants of CAB’s speed dating could arrive at the student center beginning at 9 p.m. Students that showed up at that time were able to eat refreshments while they waited. The actual event started at 9:30 p.m.
During the event, women sat at tables with a list of icebreaker questions. They were able to ask the male participants questions about themselves, their college careers, etc. The male participants sat at the table for the length of a song. Once the song was over, the male participants changed tables, while the female participants waited to see who was next at their table. More and more students showed up throughout the night. Most of them were surprised about how much fun they actually had during the event. Hung also said that if the event were to be offered again, she would go again. Tara Shiver, the president of CAB, said that she felt that the event went well and coincided nicely with Valentine ’s Day on Monday. Last Saturday Young Harris students and faculty gathered to give back to the community through Martin Luther King Jr. Day of Service. The event was planned by the campus S.E.R.V.E committee which stands for service, education, responsibility, voice and engagement. The S.E.R.V.E committee consists of the Office of Campus Activities, Religious Life and Bonner Leader programs. “The purpose of Martin Luther King Day of Service is to honor Rev. Dr. Martin Luther King’s legacy of community change within our community,” said Rouseline Emmanuel, director of Campus Activities. The event was originally planned for the prior Saturday, but due to disagreeable weather conditions the event had to be pushed back. Despite the change in date, students and faculty were in attendance to do their part to help the community. “We worked with three local agencies. Members of the YHC community helped with finishing construction on affordable housing in the Wesley Meadows neighborhood. We worked to help complete an outdoor adventure based training course for Niyelo at Towns County High School. We helped with painting, mulching, repairing and organizing the course. Finally, we walked, played, bathed and fed animals at the Human Society Mountain Shelter,” said Emmanuel. Despite 25 degree weather, people attended the day of service to honor King’s legacy and make a difference, the group consisted of eight faculty/staff members and 62 students. 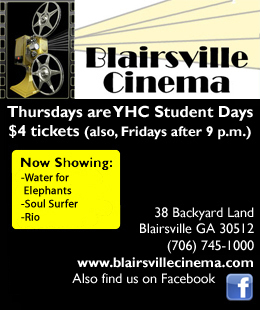 On Thurs. Oct. 14, the Campus Activities Board or CAB hosted laser tag for Young Harris College students on the plaza. The laser tag event was held in a complex that was provided by TjohnE Booking and Production company. The complex was a giant inflatable dome. Students wishing to play laser tag were divided into two teams of five. Each set of teams were allowed to play for 10 minutes each round. In all, there were about 200 YHC students present and most of them played multiple rounds of laser tag throughout the night. There were eighteen rounds played in all. In addition to the laser tag event, CAB also provided hot chocolate to participants, keeping YHC students warm while they waited for their turn to compete in the next round of laser tag. Because of the great student turn out for the event, laser tag rounds lasted from 7 p.m. to 11 p.m.
Calle Wallace, the social activities director for CAB, assisted in organizing and setting up the laser event. Wallace and Jade Garrison, publicity director for CAB, were in charge of advertising for the event. On Tues. Oct. 19 Campus Activities Board hosted a pool tournament in Myers Student Center. The tournament started at 9:00 p.m. and ended about 10:45 p.m. Out of the 24 students that signed up for the event, 19 students showed up to compete in the tournament. Each player entered the contest with the hopes of winning a $25 gift card from Wal-Mart. Jake Davis, the recreation chair for CAB, organized the tournament. Both of the pool tables in the student center were used, despite claims that one of the pool tables was less level than the other. Both pool tables were used simultaneously so that the event would not end up taking all night. Players could call their shots if they wished. However, if both players agreed not to call the pockets, then shots were not called. During the game between Tim Linley and Alex Spiegel, an argument broke out between the some of the foreign exchange students from Europe and the American students about a technical rule. The European kids argued that when you scratch you can put the cue ball anywhere on the table. However, the American students argued that the ball had to be placed on the end of the table. Upon looking at the official rules, it turns out the European students were right, and the cue ball was allowed to be placed anywhere on the table. After a few rounds of pool, Declan Traquoir from Scotland ended up winning the tournament. “It feels great to win the tournament,” said Traquoir. A bustle of noise could be heard coming from Myers Student Center this past Tuesday night, where students gathered together for the second Coffee House this semester to enjoy live music, good food and lots of laughs. Hosted by the Campus Activities Board, or CAB, the student led event was set for a relaxed evening with low, soft lights and trays full of baked goods and snacks for everyone to munch on. The evening opened with live music played by some of Young Harris College’s local talent including Cedric Epps, a sophmore music major from Talbotton and Alex Gannon, a senior Music major from Blue Ridge, among others. The group of students refer to themselves as the Young Harris Rhythm, using instruments from electric guitar to piano. Laughter began to fill the room when the improv group SuperTroupers took the floor. Started late last year by Brandon Engleskirchen, a junior theater major from Jefferson, SuperTroupers consists of students who all share a common passion for clean, comical entertainment. “We want to show people that improv can be funny without being inappropriate.” Brandon explained. The group of students tickled everyone’s funny bone as they acted out various skits with help from ideas thrown out by the audience. The musical and comedy entertainment provided everyone with some good, clean fun and an escape from the everyday school grind. Cory Harrison, a senior history major from Atlanta shared his feelings about the event. “This is my first time ever coming to a Coffee House, and I am glad I took the time away from studying to see this,” Harrison said. In order to provide feedback from the evening, surveys were passed out to members of the audience asking their overall opinions of the event and requesting advice for future Coffee Houses. Janelle Morris, a senior English major from Canton put into words her feelings for the night. “I really enjoyed everything they had here tonight, but if there was one thing I would like to see more of would be spoken word,” said Morris. Coffee House gives the student body a chance to gather together and appreciate the talents of their peers. Judging by the reaction of the audience, it seemed as though everyone had a great time and enjoyed all that was offered. Coffee House is held three-four times a semester and is hosted by CAB. For more information contact any member of CAB or the Office of Campus Activities.